MORAINE, Ohio — The 21-year-old driver who survived a wrong-way crash with a family of three was frothing at the mouth when medics attempted to revive her, according to a police report released Tuesday. She wasn't sick. It was beer. 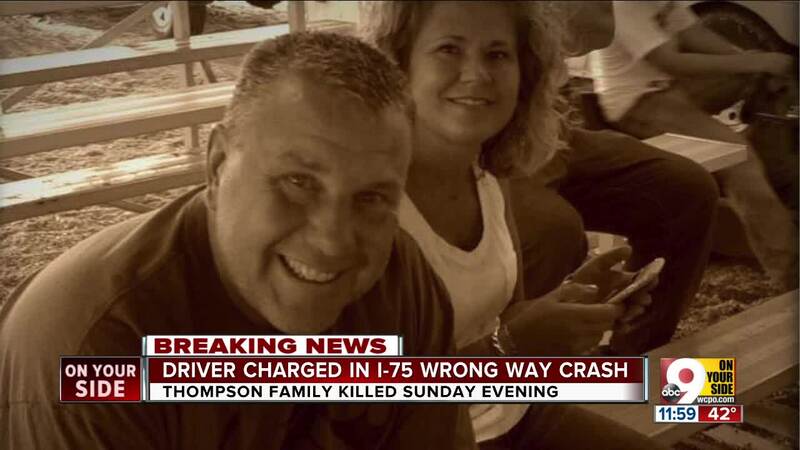 Timmy Thompson, 51, 50-year-old Karen Thompson and their daughter, 10-year-old Tessa Thompson, were all killed in the crash with a wrong-way driver when they were driving southbound on I-75 in Moraine at about 8 p.m. Sunday. The driver, 21-year-old Abby Michaels of Xenia, remained hospitalized in serious but stable condition at Miami Valley Hospital Monday, according to a news release from Moraine police. Police said Michaels crossed over the median via a paved turn-around area for emergency vehicles and then drove northbound in the southbound lanes before she her Kia Forte collided head-on with the Thompson family's Toyota Camry. Witnesses told police that she was driving in the middle lane toward oncoming traffic for just 10-15 seconds before the crash. The police case report states beer came from Michaels' mouth as medics attempted to make her breathe. She was wearing a "festive" St. Patrick's Day shirt, multiple green shamrock necklaces and a temporary tattoo of a beer mug on her right cheek. An officer found a large cup with a Fireball whiskey logo in her purse. Police previously told WCPO news partner WHIO that they believe alcohol was a factor in the wreck. A blood sample was sent to the Ohio State Highway Patrol Crime Lab for analysis. Neighbor Terri Holt recalled the Thompsons as "a beautiful family." Karen was a beloved teacher at Taft Elementary School in Cincinnati. The Archdiocese of Cincinnati released a statement calling Tessa, who was a student at St. Susanna Parish School, "a bright light who had a great effect on students and staff."